Keeping kids of all ages happily busy while exploring Denver is easy. Take a look at the wide range of family-friendly activities and attractions, then consider our sampling of hotels that will have your kids or grandkids grinning from ear to ear and counting sheep while they sleep. Downtown is ideal for easy access to a terrific mix of amusements like the Downtown Aquarium, Elitch Gardens Theme & Water Park, Denver Art Museum, Coors Field, Pepsi Center and History Colorado Center. Pre-teens and teens will especially love staying at The Crawford Hotel above the buzz of Denver Union Station or on one of the 13 uniquely themed floors at The Curtis – a DoubleTree by Hilton. The beautifully restored Union Station is a hub for travelers arriving by Amtrak, bus, airport train or light rail. It also provides a great dining and shopping option or simply a place to get a cup of joe or a pint of local brew. Guests staying on-site at The Crawford Hotel not only have spectacular city views, they can order breakfast in bed from Snooze, one of Denver’s spots for a.m. delights, or wrap up an afternoon or evening with a cone or cup from Milkbox Ice Creamery, which is included in the stay. Teens are sure to be impressed riding to a nearby downtown location in the hotel’s Tesla courtesy car and can challenge mom or dad to a game of shuffleboard in Union Station’s Great Hall. All ages can dash through the outdoor fountain out front, made just for that purpose. Greeting the morning is more fun when wake-up calls are from celebrity impersonators at The Curtis, a DoubleTree Hotel. It won’t take long to rally the troops when walking out your guest room door means checking out photographs of fetching hairdos and posters of the musical “Hair” on the Big Hair Floor (9th floor) and scary stuff on the Dun Dun Dunnnnn! Floor (13th floor), where Jack Nicholson as Jack Torrance in “The Shining” and a vintage vacancy notice from the Bates Motel keep things on the creepy side. Any of the guest rooms are fun to spend a night or two in or splurge on a hyper-themed room like The “Knock, Knock… Who’s There?” option inspired by favorite knock-knock jokes and filled with odds and ends from rabbit art and a moose head to Charlie Chaplin hats. Or consider the "Star Trek," "Ghostbusters," disco, big hair or video game rooms, where you might have a green slime floor, beauty salon chair or Donkey Kong arcade game as part of the decor. The fun starts immediately when you walk in the lobby and find all sorts of retro candy to purchase and board games to play there or up in your room. Newer to the downtown scene is The Maven Hotel at Dairy Block with modern bunk rooms featuring a twin bunk bed located over a king bed. Swings that hang outside the elevator doors on landings are sure to capture the attention of kids, along with the recently opened Milk Market at Dairy Block, a 15-concept food hall where you can get everything from pizza to a burger along with ice cream and cocktails for the adults. Plus, the Alley at Dairy Block is awesome to explore with outdoor interactive art and games like corn hole. 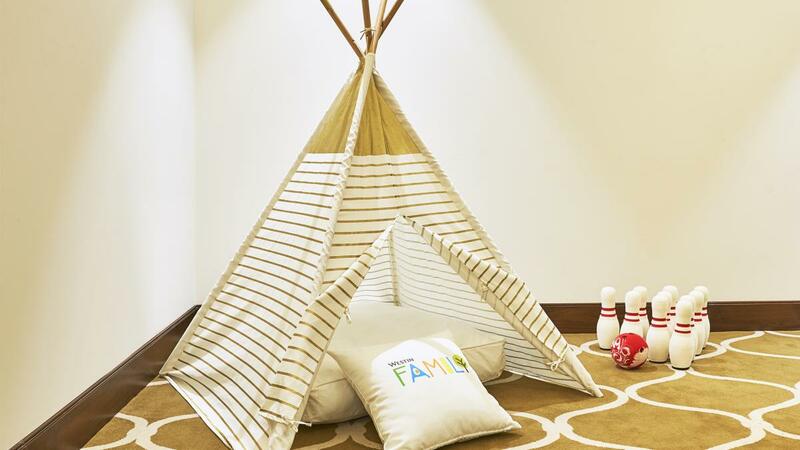 The Westin Denver Downtown has in-room teepees for guests who have little ones and book the hotel&apos;s family package, and kids under 12 eat free with the purchase of an adult entrée in the hotel’s restaurant. The Ritz-Carlton, Denver also brings the outdoors in with a Kids City Camper Experience that includes a children&apos;s tent equipped with a Colorado wildlife book, plush lion stuffed animal and more. The Ritz has a special check-in process for families, a property scavenger hunt for kids and children-specific menus available through in-room dining and Elway&apos;s Downtown. For those who purchase club-level access, sample Black Cow Cookies that were inspired by the invention of the root beer float in Cripple Creek, Colorado. 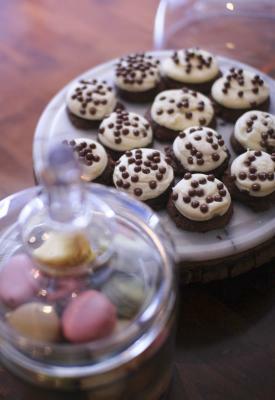 Originally known as the Black Cow, the sweet treat was said to have emulated Colorado&apos;s snow-capped Cow Mountain! Four Seasons Hotel Denver also rolls out the welcome mat for families with child-size bathrobes, baby and children&apos;s toiletries, tents, Nintendo Wii gaming systems and a library of DVDs, CDs and games. Submit the names and ages of your kids and the Four Seasons will prepare a welcome amenity. Both the Four Seasons and the Westin Denver Downtown have rooftop pools, and the Grand Hyatt Denver has rooftop tennis and shuffleboard. Another sector of the city that is ideal for families is Cherry Creek North with the Cherry Creek Shopping Center, all sorts of unique restaurants and shops in a quaint neighborhood district, easy access to Cherry Creek Trail and an eight-screen movie theater that has 100-plus drink choices and a RealID 3D viewing experience. JW Marriott Denver Cherry Creek has long been a family favorite with large guest rooms, suites, kid-sized robes, and a JW Marriott Denver coloring and activity book that includes a scavenger hunt, word search and fun facts. On Sundays from 7 a.m. – 1 p.m., guests can enjoy the Pancake Social at the JW’s Social Fare restaurant with a complimentary pancake buffet especially for kids age 8 and under. A kids’ room complete with crafts and family-friendly movies is available during the Pancake Social. In the northwest part of the Denver metro area, there are several properties that are good fits for families in Broomfield and Westminster. Omni Interlocken Resort & Spa in Broomfield is a full-service resort with 27 holes of golf and two outdoor heated pools and a hot tub that are located on a spacious deck and open year round. A poolside bar and grill make it easy to spend a day lounging, and “Dive-In” movies begin at dusk on Friday and Saturday evenings from Memorial Day through Labor Day. Through the Omni Kids Crew program, kids receive a backpack filled with fun items upon check-in, and milk and cookies are delivered to their guest room on the first night. Plus, there might just be the chance to meet Vista, the hotel’s new bee mascot that ties into the honey being produced in beehives on-site in a meadow behind Vista Course Hole No. 3. The Westin Westminster has an indoor pool and an ideal location by the Butterfly Pavilion; City Park with disc golf, soccer fields, playground, trail access and more; and Westminster Promenade with restaurants, shopping, a cinema, entertainment centers and the three-rink Ice Centre. The Westin gives kids a travel journal and a local activity guide. Denver Marriott Westminster offers packages for families that include lodging, breakfast and admission to either the Butterfly Pavilion or Water World, also located in Westminster. Photos courtesy of The Maven Hotel (top); Ritz-Carlton, Denver (side); and the Westin Denver Downtown (bottom).